It's getting increasingly difficult to feed humanity's seven billion-plus mouths, especially as climate change begins to wreak havoc on the world's staple crop supplies. While efforts are being made to find hardier alternatives, a research team from the University of Sydney has developed a tool to better manage the crops we've already got. Industrial agriculture is currently facing some dire challenges. Today's farmers must contend with shrinking crop yields and disappearing profit margins thanks to a rapidly warming planet, not to mention the political and socioeconomic fallout of maintaining the current system of migratory farm labor. However, the Ladybird farm automator could hold the key to solving both issues. "The automation of on-farm processes is poised to play a decisive role in minimising input and maximising output of future agriculture," Dr James Underwood, Senior Research Fellow from the university's Australian Centre for Field Robotics, told ABC Australia. "Automation can help to increase efficiency and yield, by having many of the manual tasks of farming performed by specially designed agricultural robotic devices." The "Ladybird" was designed and built specifically for the vegetable industry with the aim of creating a ground robot with supporting intelligent software and the capability to conduct autonomous farm surveillance, mapping, classification, and detection for a variety of different vegetables. This is not unlike the Blue River Lettucebot. 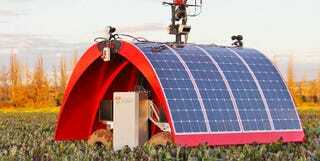 "Ladybird focuses on broad acre agriculture and is solar-electric powered. It has an array of sensors for detecting vegetable growth and pest species, either plant or animal," University of Sydney Robotics Professor Salah Sukkarieh said in a press statement. "She also has a robotic arm for the purposes of removing weeds as well as the potential for autonomous harvesting." The $1 million Ladybird also serves as a prototype test platform for other agricultural automation systems that the team is developing. The Ladybird recently moved out of the lab and into a test field, spending three days monitoring the vegetative robustness of a Cowra-area onion, beet, and spinach farm. "The robot was able to drive fully autonomously up and down rows and from one row to the next, while gathering sensor data. Sensors include lasers, cameras and hyper spectral cameras," Professor Sukkarieh said. "Part of our research program is to find new ways to provide valuable information to growers about the state of their paddocks." A lot of the time in horticulture, if you're short of an element in the plant, by the time you see a symptom it's too late, they will be able to pick up a nutrient deficiency before we see any symptoms. Secondly, you can use it at night at 2 o'clock in the morning and go out and do an insect survey, so things like cutworm popping out at night time, slugs, worms, things like that. Instead of getting out of bed at 3 o'clock in the morning and wandering around with a torch and looking at about five square metres, this thing could do two or three hectares at night and then in the morning you can just see what you've got.